Melbourne has the best coffee in the world and I’ve found proof in the seaport city of Valparaíso, some 120 km (90-minute bus ride) from the Chilean capital of Santiago. 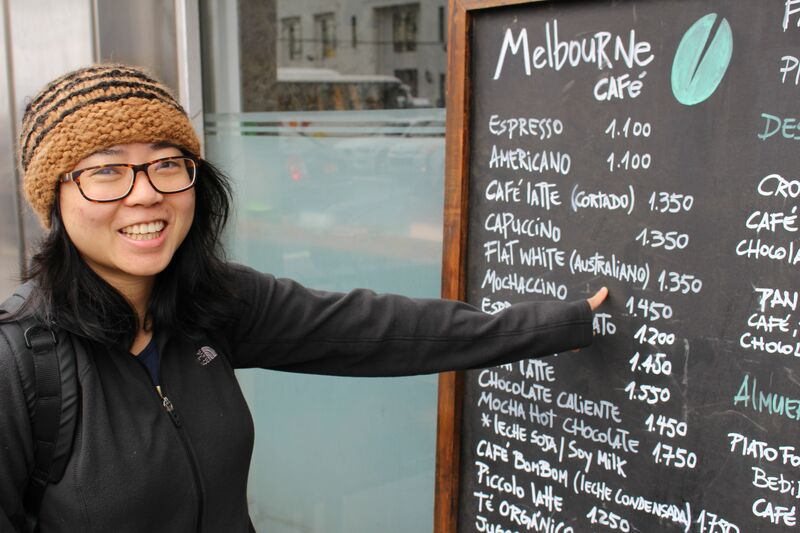 In Valpo’s main square is the “Melbourne Café”, a café which markets itself as “making coffee, just like in Melbourne”. The menu features the flat white – “Australiano”. And the café is decorated with prints of Melbourne sights like Luna Park and the big purse outside the GPO. Melbourne coffee – si gracias! How could we not stop for an Australian flat white! I’ll have a double shot, please. Now, of course we didn’t travel 11,000km to have fake Melbourne coffee. We had come to Valpo after a German couple on our wine and bike tour in Santiago told us to go. And what a hidden gem Valpo turned out to be. 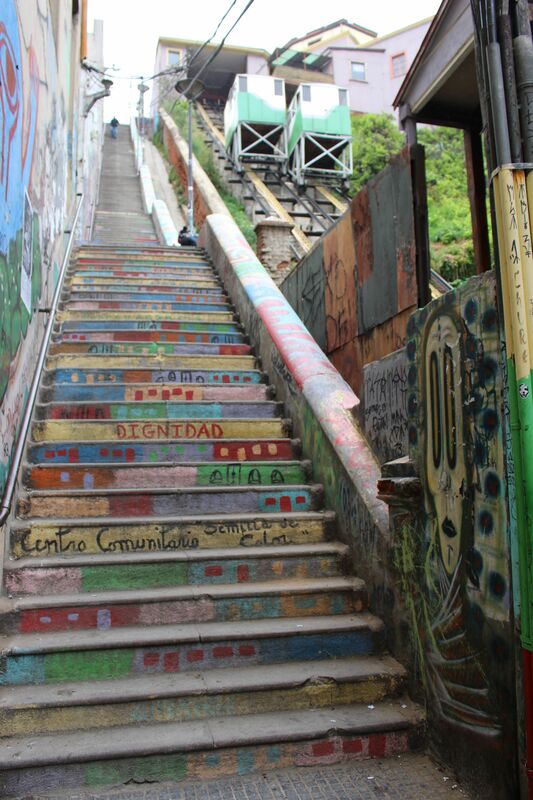 Valpo is an example of a fallen South American city, but with a recent bohemian revival. Back in its heyday (late 1800s to 1910s), Europeans travelled to the US for the Californian gold rush. To get there, Europeans had to sail around (go around – ocker accent). Valpo became a compulsory stop for supplies. Travellers were charmed by the beautiful hills, ocean views and vast shorelines (think Amalfi Coast) so they stayed, setting up shops, houses, churches and other beautiful buildings in colours which would rival Joseph’s amazing dream coat. But then the 1906 earthquake devastated the city. Further, in 1914, the Panama Canal opened and Valpo was no longer a mandatory stop. The city dissipated, the immigrants left and the hills were alive with the sound of crickets. However, over the past 15 years, the Chilean government has caught onto a good thing and has restored many of the historic buildings, turning them into restaurants and art galleries. In 2003, the historic centre was declared an UNESCO World Heritage site. 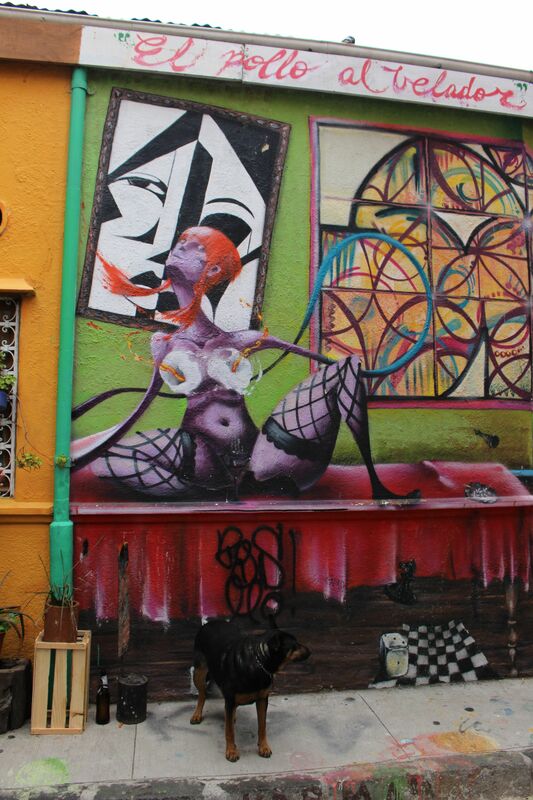 This means tourists, artists and cultural buffs have flocked to the city’s hillside, breathing in the sea mist, strolling the city’s cobbled alleyways and marvelling at the quirky street art. To get to the hillside, you have to catch one of the eleven working funiculars, which were built before women could vote. They work by being extremely slow and noisy. And it will cost you 100 Chilean pesos (20 cents) per ride. The povo area where the bus terminal is situated. It’s chaotic, dated and not where you would want to find yourself in the late hours of the evening. When you get off the bus, it’s disorientating as you work out where you are supposed to go after that (el centro is another 30 mins trolley bus ride from the bus station). Stray dogs are everywhere; supposedly they are fed by the government and loved by locals. They’re mostly harmless, but just something to be aware of. Yes, there is a coastline but there aren’t recreational beaches; for those, I hear good things about Viña del Mar, some 14km away. Despite this, we had a great day and I predict big things for Valparaíso, with or without Melbourne coffee.